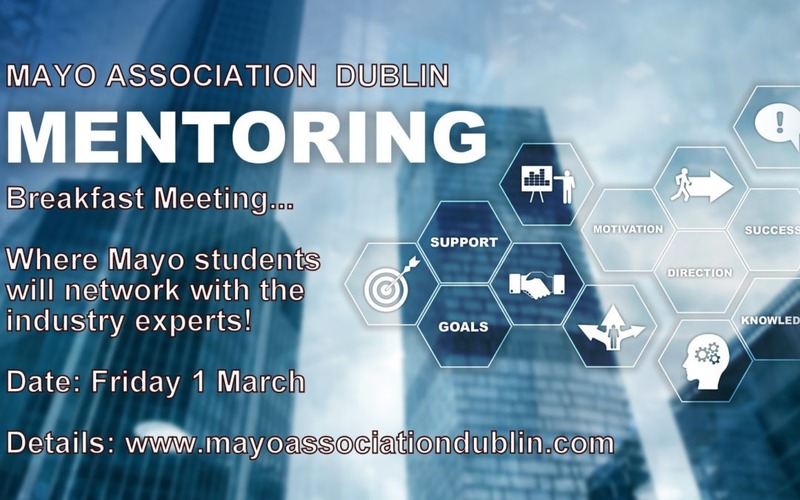 Mayo Association Dublin is hosting this unique Mentoring and Networking Event for Mayo people based in Dublin. Whatever sector you work in or whatever work you wish to get into, sign up and benefit from the connections, experience and expertise of Mayo’s industry leaders in Dublin. The breakfast meeting will take place at the offices of law firm Byrne Wallace on 88 Harcourt Street, Dublin 2, on Friday 1 March. Starting at 7.30am sharp and concluding just before 9am, our event will consist of networking and connecting with people over a light breakfast throughout the morning. The purpose of the event is for Mayo people starting off in their careers to learn from, network with and get some invaluable advice and guidance from other Mayo people who have trodden their path ahead of them. Mentors and mentees will be connected over a light breakfast, where informal advice will be given and contacts and networks established and strengthened. Mentors who are not already members of our Association will be asked to join on the morning of the event or they can sign up here online….it’s just €25 for life membership!